Cowboy Bookworm grew from Billy Huckaby's passion for books and rodeo. Good books about rodeo were hard to find and most were out-of-print. Huckaby launched Wild Horse Press and the first book published was Bob Crosby: King of the Cowboys. From there Huckaby launched Cowboy Bookworm to serve the retail market. 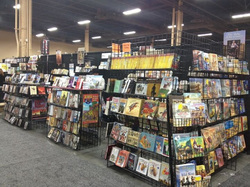 The first year Cowboy Bookworm had a booth at Cowboy Marketplace in Las Vegas it was 10 ft by 10 ft and consisted of a table, two chairs and approximately 10 titles. Cowboy Bookworm booth occupies grew to 10 ft by 30 ft and close to 1,000 titles are available. Huckaby has also gained a reputation for being able to locate hard to find and out-of-print books. Some of these titles are now back in-print thanks to Huckaby and Wild Horse Press. In 2014 Huckaby formed Wild Horse Media Group and acquired one of the oldest and largest independent publishing companies in Texas whirch included Eakin Press and NorTex Press. "One of the most gratifying aspects of the business has been people complimenting me on the quality of our selection," Huckaby said. "I always tell them that I buy books that I want to read and if they don't sell I can sit around and read them in my old age."